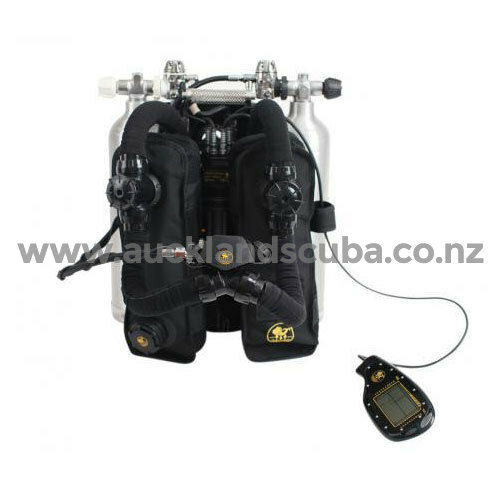 Designed, built and tested to perform in all conditions, the POSEIDON SE7EN is the next generation rebreather. Safety, performance, ease of use and desirability are combined to enable divers of all abilities to experience the underwater world without compromise. Whether you want to get closer to marine life, spend much more time underwater, dive deeper or simply enjoy the bubble-free silence, the POSEIDON SE7EN is the smartest, fastest, safest way to dive. 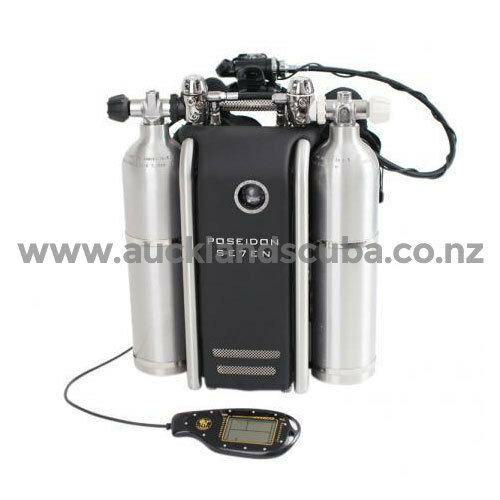 The Poseidon Se7en Rebreather is a fully closed-circuit, automated rebreather (eCCR) that will allow you to have a very different and improved diving experience. The Se7en is exceptionally small, light and simple to use. With an unmatched degree of automation, the diver is better able to enjoy the dive. Everything in the Poseidon Se7en is made with simplicity and safety in mind. 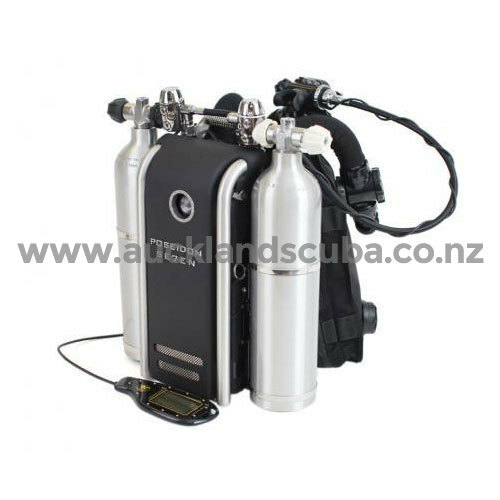 To be ready to dive, the rebreather diver needs only to add a pair of oxygen and diluent supply cylinders, plus a harness and wing (BCD). Less the cylinders, the entire unit can be carry-on luggage for most airlines. Every rebreather requires formal, model specific, training in order to competently dive with the equipment. Rebreather equipment pricing does not include training, and training is solely the responsibility of the purchaser. Training is available at Water Junkie for all models we sell. The typical full course training time is 3-7 days consisting of a classroom lecture, confined water session and at least four OW dives. Our recommendation to divers seeking rebreather training is to select an instructor having several hundred hours of rebreather dives and for whom rebreathers are their primary mode of diving. If you are not already certified for the rebreather, per manufacturer requirements you will receive a disabled unit that can only be enabled by your instructor. Once you complete training, your instructor will permanently enable your unit. For general information on rebreathers, transitioning to closed circuit diving, training logistics and cost estimates, plus other reference materials about rebreather training, please contact our staff senior rebreather instructor Grant Searancke. Generation 7 electronics open up endless possibilities for interaction, accessories and apps. Entirely new internal hardware driven by a new generation of firmware makes the SE7EN faster, flexible and reliable in any diving environment. 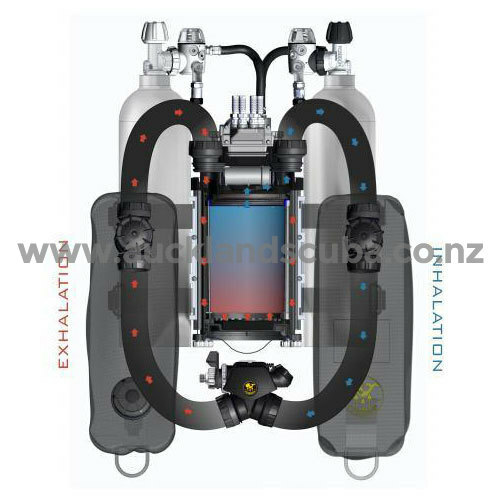 Enjoy enhanced interaction with your rebreather. The upgraded configuration tool interacts with your POSEIDON SE7EN via Bluetooth, allowing you to make configuration changes in moments. See your dive logs in far greater detail and much more. Better still, it’s now Mac compatible! Poseidon already has class-leading reliability and technical support, but the POSEIDON SE7EN makes service and support even easier and more convenient. Automatic dive log downloads to support via Bluetooth, combined with detachable displays and sensors mean that support is even faster and more convenient than before! Protective, desirable and functional in equal measures, the cover on the Poseidon SE7EN has a built-in handle and trim weight system, along with grab and lighting rails.